The daughter of leading African-American abolitionists James and Charlotte Forten, Harriet Forten Purvis was a powerful 19th century voice for equal rights for all—including women. Harriett Forten married Robert Purvis in 1832 and made a home for their children in Philadelphia, where both Harriett and Robert led their communities in the fight for civil rights. Because women were not permitted to join the American Anti-Slavery Society, Harriett joined with more than a dozen other women, including suffragist and abolitionist Lucretia Mott, to establish the Philadelphia Female Anti-Slavery Society. Here, she turned her skills as a seamstress to both the sewing committee of the Society and a sewing school in a poorer part of the city. Harriett and nine others initiated a boycott of non-free (slave labor) products, including cotton and produce. She lectured on civil rights and in a speech to the Society on September 13, 1866, denounced segregation on railroad cars. 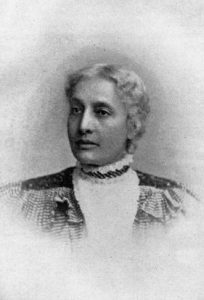 Her role within the Society gave her the opportunity to associate with anti-slavery leaders from outside Philadelphia, such as the well-known African-American lecturer Sarah Parker Remond. Until 1854, Sojourner Truth was the most prominent African-American abolitionist who also advocated for the rights of women. But in the years that followed, African-American women became more visible and vocal in their beliefs. Together with her sister Margaretta, who was also an educator and abolitionist, Harriet became one of the lead organizers of the fifth annual National Woman’s Rights Convention. Immediately following the Civil War, a number of African Americans, white abolitionists and suffragists joined together to work for universal suffrage. In 1866, they formed the American Equal Rights Association (AERA). Harriet joined other active members, including Sarah Remond and Sojourner Truth in public advocacy of voting rights for African Americans and women. When a rift in the movement developed over whether to include women in the 15th Amendment on suffrage for men who were former slaves, Harriett joined forces with an old friend, Susan B. Anthony, and united with the National Woman Suffrage Association (NWSA) to support an amendment for women’s suffrage. Robert Purvis founded Philadelphia Vigilance Committee in 1837, and after he and Harriett used their Philadelphia home to harbor escaped slaves, he became known as the father of the Underground Railroad. Later, to escape a violent backlash, the couple retreated to the rural community of Byberry, where their home, Harmony Hall, because a prominent station on the Underground Railroad. Darlene Clark Hine, editor, Black Women in America (Brooklyn, NY: Carlson Publishing, Inc., 1993), p.444. Rosalyn Terborg-Penn, African American Women in the Struggle for the Vote, 1850-1920 (Bloomington, IN: Indiana University Press, 1998). Public domain photo from http://explorepahistory.com/hmarker.php?markerId=1-A-107.